Few areas of the country need air conditioning like Arizona. The American Southwest is known for hot and arid weather, little to no rainfall, and huge population growth, reports the Environmental Protection Agency (EPA). In fact, the Arizona population grew three times faster than the national average between 2000 and 2010. As a result, increased construction, new HVAC system installations, and HVAC retrofits are driving the Arizona HVAC industry. Furthermore, the state’s scare water resources and drought conditions will require the implementation of energy and water conservation measures for HVAC systems. HVAC needs in Arizona have grown in recent years as the state has experienced higher-than-average population growth. David Martin, President of the Arizona Chapter of Associated General Contractors, stated that 200,000 more people will be heading to Arizona in 2015, translating into at least 40,000 new HVAC units per home (given a family of four). However, this number does not take into account already existing homes whose HVAC system may need retrofitting to become more energy efficient. 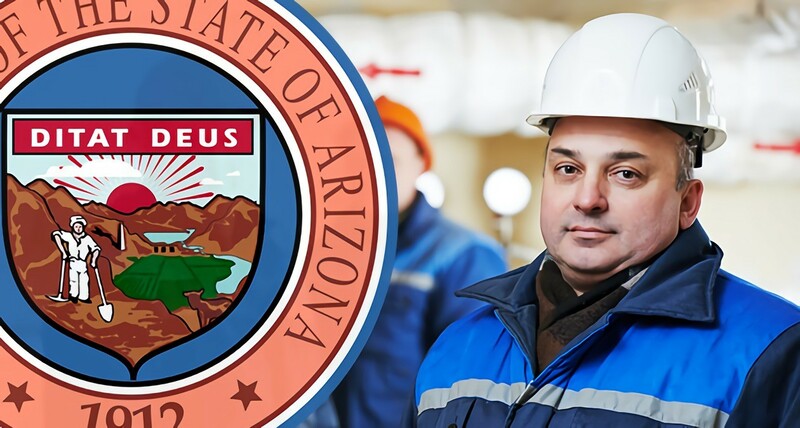 AZ Big Media reports that the state will need additional architects, engineers, subcontractors, technicians, and other general contractors to meet the needs of Arizona’s growing population. Additionally, more people are expected to move from rural to urban settings, which could further drive the demand for HVAC technicians as older HVAC systems will need to be repaired or replaced. The Bureau of Labor Statistics (BLS) states that most HVAC systems require replacement every 10 to 15 years. Arizona’s dry, hot climate is ideal for “passive” solar heating and cooling, which is a form of heating and cooling that aims to utilize factors such as location, climate, weather and natural ecosystems to maximize energy efficiency. The Grand Canyon State is in fact at the forefront of solar energy technology. Considering the EPA’s prediction for Arizona’s population growth, HVAC technicians could soon be busy installing new HVAC systems and repairing or replacing older systems. Professionals with HVAC certification will also be responsible for performing routine maintenance of older systems and implementing green technologies into existing HVAC systems. Three primary forms of passive HVAC systems used in Arizona include controlling heat gain, use of convection for cooling, and radiative cooling systems. Heat gain control methods seek to prevent heat gain in hot weather. For one, shadows from nearby buildings reduce heat gain, however, not many homeowners have control over their neighbors. Insulating a home can achieve the same end, through methods such as window stripping and thermal masses, which inhibit heat absorption in a structure. At night, thermal masses radiate heat back into the eve’s cool air. Thermal masses work best for buildings that don’t have any nearby structures. Since many older homes or structures are in close proximity to other buildings and installation of thermal masses may require extensive work, thermal masses are best suited for newer buildings. Convective cooling methods use the prevailing winds and natural convection to ventilate a building. Technicians with an HVAC education may install exterior vents in existing buildings, which allow exterior air movement to cool a structure. The height and location of the vents is determined by the building’s orientation and nearby structures. For older buildings with less insulation and difficult access to the interior, exterior vents can be used to enable cooling without requiring intensive renovation of existing structures. However, vents may also be installed as an additional means of improving energy and water consumption in new structures. Roof ponds are another popular form of interior temperature regulation in Arizona. Sealed pouches of water on the roof are used to absorb heat during the day and release heat at night, thus reducing heat gain. However, this technology is limited to structures of minimal height. Since the release of heat relies on “water ponds” located on the roof, the surface area of the pond will determine how much heat is absorbed and released. As a result, taller structures, such as multi-level buildings, apartment complexes, and skyscrapers, will have a higher heat gain and be unable to absorb and release much heat this way. Ultimately, innovative cooling technologies used in Arizona enable HVAC systems to operate with significantly less energy by reducing the rise of temperature inside a given structure. Trained HVAC professionals can consult customers as to which of these methods suits their building structure and temperature-control needs. Given the aforementioned data provided by the BLS, buildings older than 15 years will need the skills of an HVAC technician to install, repair, maintain, or upgrade their HVAC systems. If you’re interested in embarking on a promising HVAC career in Arizona, contact RSI today for more information.